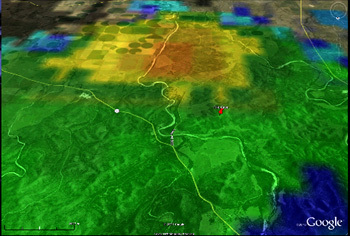 Radar reflectivity of bats emerging from Frio Cave in Texas derived from the SOAR interface and overlaid on Google Earth. Storm chasers have become bat counters. A UC Santa Cruz scientist, working with meteorologists at the University of Oklahoma, is using mobile storm-chasing radars to follow swarms of bats as they emerge from their caves each night to forage on insects. Frick, a bat expert, is working with professor Thomas H. Kunz of Boston University, Phillip B. Chilson, associate professor of meteorology at the University of Oklahoma and Kenneth Howard at the National Oceanic and Atmospheric Administration's National Severe Storms Laboratory. The team described its innovative research at the annual meeting of the American Association for the Advancement of Science on Saturday, February 19, in a presentation titled "Aeroecology: Transcending Boundaries Among Ecology, Meteorology, and Physics." 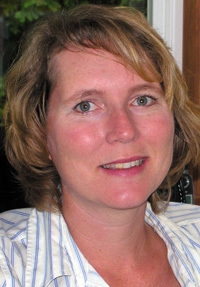 Kunz coined the term "aeroecology" two years ago to describe the interactions of organisms-–birds, bats, and insects–-in the lower atmosphere. Aeroecology can be recognized as a stand-alone discipline just as marine biology is recognized as a stand-alone discipline concerning life in the oceans, Frick said. "It's very interdisciplinary or transdisciplinary in the sense that it involves bird biologists, and bat ecologists, entomologists, radar scientists, and meteorologists," she said. Frick received a National Science Foundation fellowship in bioinformatics to use current radar technologies to estimate densities of bat populations in the atmosphere. A year ago, she and Kunz, with whom she has worked for years, met with atmospheric and radar scientists at the University of Oklahoma in Norman, Okla., to collaborate using weather data collected by radars to study bat populations. 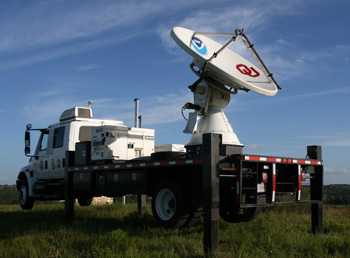 In addition to truck-mounted mobile radars, Frick and her colleagues use data from 156 fixed NEXRAD weather radars around the country. Familiar as "doppler radar" from TV weather reports, these radars have recorded and archived atmospheric data every five minutes for the past 20 years. Scientists at the National Severe Storms Laboratory in Norman collect NEXRAD radar data to predict weather patterns but first they must filter out "bioscatter"--birds, bats, and insects--to focus on weather patterns, Frick said. "They want to get rid of this bioscatter clutter to make accurate storm predictions," she said. Now, the storm scientists are reversing the filter to instead focus on bioscatter. That offers the potential of looking back two decades to see population changes among bats, insects, and migrating birds. They've developed a web site called Surveillance of Aeroecology using weather Radars, or SOAR, that will be a "bioscatter portal," Frick said. There researchers can look at patterns of bat emergences from colonies, bird migrations, and even Monarch butterfly migrations. 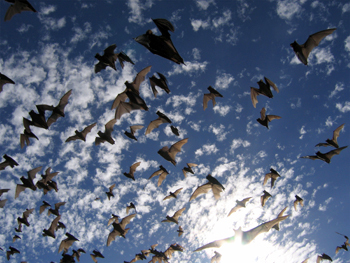 Last July, the team positioned a mobile, storm-chasing radar from NOAA outside Frio cave in Texas to focus on swarms of Mexican free-tail bats. Using calculations of the amount of radar backscatter from a single bat in the laboratory, the group is developing the first means to calculate aerial densities of bats as they travel on the wing. In August, Frick and Kunz published findings suggesting the possible extinction of the little brown bat in the northeast United States because of a fungus that disrupts the bats' hibernation cycles.